Limited Only By Your Imagination.. Original designs and custom orders are always welcomed. Our only limit is your imagination! We invite you for a free consultation at your convenience, see contact information to the right of this page. Our quality production through our hot foil stamping process has gained recognition across North America. We produce a variety of shapes and sizes of wood, vinyl, plastic and leather articles to satisfy your need for unique collector items, keepsake items and special event and holiday favors. You choose to create beautiful and unique embossing in a variety of colors. Most items accept printing on both sides. You have options to attach a magnet, pin, ribbon or card. You pick the shape, our variety is endless! Canada Wide Woods is 100% Canadian and was proudly owned by its founding partners Larry M. Walker and Bill Cousins. Since 1992. we "Your Ontario Woodsmen" and "Canada's Wooden Nickel Company" have operated in Gadshill, Ontario. In August 2015 Canada Wide Woods was purchased by James A. Williston and the manufacturing facility was moved to the City of Calgary, Alberta Canada. We are proud to be a reputable supplier of the Canadian Association of Wooden Money Collectors (C.A.W.M.C. 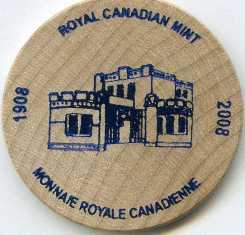 ), the national organization for Collectors of Canadian Wooden Money, Tokens, and Souvenirs. They would be pleased to welcome all such persons to their membership. Like the C.A.W.M.C. and its members, we hope that you will find the hobby as delightful as we do. We look forward to servicing your future needs. We are also a long time member of the International Order of Wooden Money Collectors the largest wooden money hobby group in the U.S.A. Additionally we are a member of the Penn Ohio Wooden Money Collectors who are headquartered in Ashtabula, Ohio. Our Special Subscription Series are sets of 20 different wooden coins and /or flats appealing to the most ardent wooden money collectors. Although many of the existing sets have been sold out, James A. Williston does have a limited number of past issued sets available for sale. Contact him by e-mail at jawilliston@shaw.ca for availability! Logo, images, pictures, trademarked protected on behalf of Canada Wide Woods.